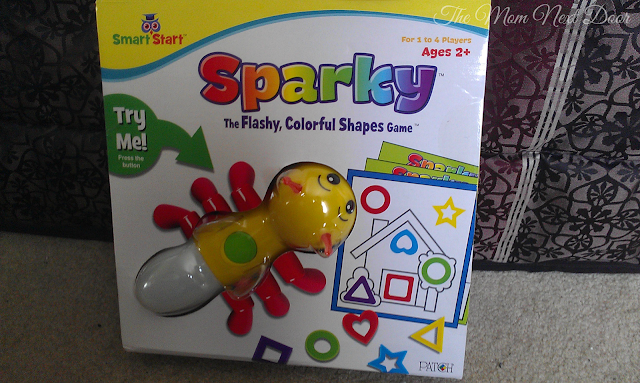 Simply Nerdy Mom: Sparky: The Flashy Colorful Shapes Game + GIVEAWAY!! Sparky: The Flashy Colorful Shapes Game + GIVEAWAY!! 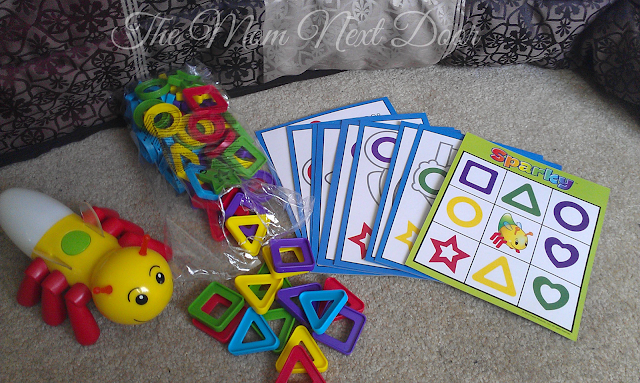 My little one loves to learn, and I love making learning fun for him, which is why I love this Sparky: The Flashy Colorful Shapes Game by Patch Products. This adorable game helps children learn shapes and colors as well as following simple directions. Your Sparky game comes with double sided cards, an assortment of colored shapes, and a light up Sparky the firefly (batteries included). When you press Sparky's back, his bum lights up a color and he asks you to find a certain shape. Your child finds that shape in the color of Sparky's bum, and matches it up on the card. It's Bingo for younger children. Your child wins by getting three in a row or 4 corners. You an also flip the card over and match up shapes to complete pictures. My son loves this game since he loves to learn. He already knows his colors and shapes pretty well, but he still loves the challenge of trying to get "bingo" as well as finishing the pictures on the backs of the cards. I think Sparky the firefly is adorable and fun.